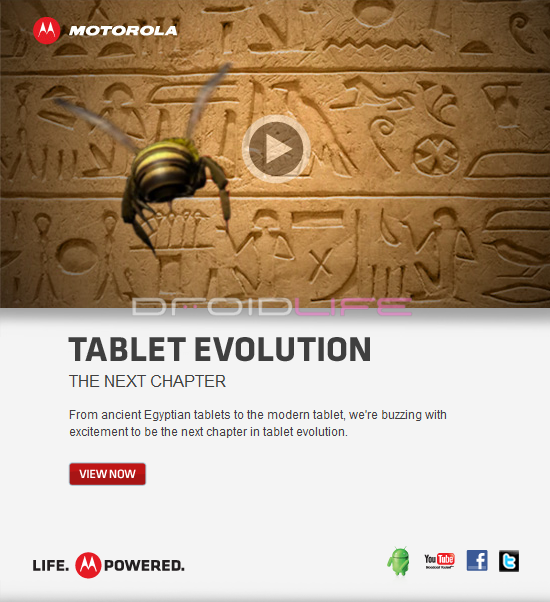 The “Tablet Evolution” video that Motorola snuck onto Youtube the other day is now being pushed to customers via email. If you are on any sort of Moto list, you should have received the picture above which redirects you to their ultimate CES teaser vid which might have just passed 1,000,000 views as you are reading this. We’re fully expecting this tablet to be “DROID” branded and running Honeycomb, but Moto is expecting it to be one of the most amazing pieces of technology ever. We’ll know in 2 weeks. Check out the video one more time after the break.